DigitalGlobe announced today the successful launch and deployment of the QuickBird high-resolution remote sensing satellite. Once operational, QuickBird will provide the highest resolution, commercially available, satellite imagery and the foundation for a wide array of information products. The satellite was launched at approximately 1:00 p.m. MDT on a Delta II launch vehicle from Vandenberg AFB in California, USA. QuickBird was launched into a 98-degree sun-synchronous orbit. With the QuickBird safely deployed, DigitalGlobe begins its mission of providing the highest resolution commercial digital imagery and geographic information. 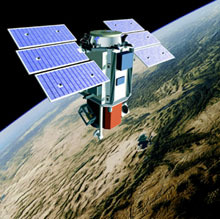 DigitalGlobe products will be available through its reseller network and online store, www.digitalglobe.com, next year. Shortly after the launch of the QuickBird, a DigitalGlobe ground station received a downlink signal confirming that the satellite successfully separated from the launch vehicle and had automatically initialized the onboard processors. The QuickBird satellite continues to perform flawlessly. After an on-orbit calibration and commissioning period of about 90 days, QuickBird will begin acquiring 61-centimeter (2-foot) resolution panchromatic (black and white) and 2.44-meter (8-foot) multispectral (color) imagery. At 61-centimeter resolution, buildings, roads, bridges and other detailed infrastructure become visible. The imagery will be used for a wide range of applications, focusing on the assessment and management of land, infrastructure, and natural resources. QuickBird will collect an industry-leading 16.5-kilometer (10.3-mile) swath of imagery that enables greater collection of large areas. QuickBird is the first in a constellation of remote sensing satellites DigitalGlobe will launch in the coming years. Herb Satterlee, president and CEO stated, QuickBird provides the commercial markets of the world easy and inexpensive access to the most refined representation of our planet ever assembled. We believe that the quality and resolution of our imagery and our commitment to our customers will demonstrate that DigitalGlobe is Clearly the Best. DigitalGlobe is an imagery and information company located in Longmont, Colorado. DigitalGlobe's QuickBird satellite has the industry leading capability to provide basic imagery at 61-centimeter panchromatic and 2.44-meter multispectral resolutions. Standard imagery and orthoproduct resolution will be offered at 70-centimeter panchromatic and 2.8-meter multispectral. DigitalGlobe is establishing a market leadership position by providing the highest resolution satellite imagery product offering, the greatest collection capacity, and the largest imaging footprint commercially available. These key differentiators are unassailable for several years to come, as there are no plans to launch a comparable commercial satellite until at least 2004. The company offers geographic information products through its digitalglobe.com on-line imagery store, an Internet-based, global archive of geographic information available to commercial businesses.